Another Weekend in the Desert! With nothing to do, I just wanted to relax, especially since I was having a Friday & Saturday off. This was time to laze around. Sipping on my Bacardi I just went on googling until I typed �MANGALORE 1930.� Immediately, I could see a few photos of my sobith Kodiyal. While going through the black shade snaps I wished for a moment how lucky I could be if I was a part of KODIYAL 1930. Not sure whether my Bacardi was strong or God heard my prayers but here I was at the Sarkari Baien (Government Well) in Bejai, a little Town in Mangalore. (Though we belong to the Bendur Parish our roots are from Bejai). Sarkari Baien is where the present Bejai Circle (Oops!!! Round about in the Middle East) was standing. Bejai looked graceful, without the modern day pollution & tension. Bang opposite the Church was the Banyan tree which I�m sure is still standing with pride until the MCC plans something nasty. There were a few people sitting under the tree, so I just walked over to them and started listening to their conversation. It was of course the Gandhian era and the topic was Salt Satyagraha. From there the topic ended up with the church activities. Finally, with no signs of the topic winding up I interrupted. "Baba yeh Izzai ba� Bombaye naye�" (Boy this is Bejai not Bombay�) Must be my attire was telling them that I was not from their soil. They called in for Ibazur who was a little boy playing at the church compound with a few friends. The moment I saw Ibazur I was shocked. For Ibazur was my grand uncle in years to come!!! Ibazur then was a small boy with Khaki shorts and no shirt� lean structure� looked like some character from the Malgudi Days!! Ibazur was the guide to take me to the Rasquinhams residence�on the way I wanted to ask him a few questions�but Ibazur had some quick fiery questions for me�.how�s Bombay�How long was the journey�.blah �blah�. blah�. Thank God I did not tell him that I live in Dubai�.. Finally we reached the Rasquinhams House. I was in shock again� this house was the place where I spent a lot of my childhood days, playing with Rohan my friend. This house belongs to him now. Settled in Canada, he has given a new look to the old Portico House. The house had a long portico with a Vakeel Banke (A bench which was in almost every house�known by Vokeel (lawyer) because you could find a lot of these benches in the court room) on both the sides and a round table with excellent carved doors�.With Rohan Rasquinha being the third generation owner of the property� the old house has given way for the new two storey�s RCC house. The hithal (compound) with lot of coconut trees and mango, cashew trees, has given way for the interlocks and lawn�. the old lanterns hanging have given way to the new French lighting fixtures�and finally the name plate at the gate which read as Rasquinha Vihar is changed as Ras Fort. I have a lot of memories connected with this house. Every Saturday afternoon we would be playing in this compound, climbing trees. Anyways I was happy I was upfront with Rohan�s great grandpa while entering into a deal of being his tenant. "Qaithan Ailayth tume?" he asked me (Where have you come from?) I wanted to tell him that I was Rohan�s friend but I�m sure the next question would be Kaun Rohan????�. Guys we are in KODIYAL 1930. So the best answer was Bombay�. "Kithya anga paulye�Pintaamcha Putacha Kazar gi?" (What made you come here�is it for Mr. Pinto�s sons wedding?) With our surnames matching I couldn�t take a better chance and told him yes. "Oh, Tume Bombay votu kaam karthahth Ge?" (You guys are working together in Bombay?) My answer was yes again. Finally with a short interview, I was given a room for 3 Anna which included Morning Pazee ani Balthuzarchi chutney (Congee & mangalorean chutney) Kolso to draw water from the well and have bath under one of the coconut trees Rasquinam directed, A goblo & ek Boshi, ek Kushae for drinking water ani Ek Lantern which would be refilled with oil every 3 days. So time management was the need of the hour. The room was cozy with a Mandiri & a Usheye�with a Kushe by the side�.I was tired for the day, so wanted to crash down for the evening� I believe it was December and the weather was great!! You really never wanted a Carrier or an Usha�it was a chilly evening. The next day I carried my lens and walked thru the pathway, now called the Bejai New Road to the main Bejai church area. Lived here later in time for a couple of years and I did know the geography of the place very well. The St. Francis Xavier�s Church was the same which I have seen for ages now. Standing with the same glory & grace. I just walked through the church gate inside and it looked all the same. More peaceful for the people who are on eternal rest & also to me� much better than the hustle bustle of the modern day life � Actually it was looking much better than today. I silently clicked a few pictures and walked through the corridor until I saw Mr. Theodore Pinto my great grandfather. I really felt like telling him Abba�Here am I you�re third generation� But am sure he wouldn�t understand this. "Tu kaun baa� anga kala karthye?" was his question. With all my respect I told him "Dev Moro Dees Devun tumka.". family, seeing my Dad. Grandad, Grand Uncles, aunts�..
Back from Kodial 1930 to Dubai 2010!! Fine article! Brings Nostalgic yet sweet memories of Mangalore yesteryears!! Thanks a lot, my dear friend!!! I just could not resist responding since you belong to my (Kularchya) parish Bendore. One way it is good to see that Kodiyal has developed but the City is lacking in those prime factors that contribute to making it a wordly class city. Roads are terrible, electricity is erratic, transport is rash, traffic is unruly- in short there is no sign of a good administration in Mangalore. Bejai of 1930's has transformed drastically. The Banyan tree which was serving as a shelter for people waiting for Bus no 24 is long gone.You will see a large pit dug below it to build a new market(When it will really come up nobody knows).The Bejai circle or the roundabout with the beautiful flowers planted inside it has given way for a electric pole.The Church which is almost 90 years old stand there as it was in 1924.Bejai of 1930's was famous for the weavers who weaved cotton cloth on the manual weaving machines.They are no more in Bejai. The Jasmine Mangalorean flowers which were beauty of the place have given way for multistory buildings.Mandri and Ushe is still there and people use it.Hital has become a area of 1100 to 1200 sqft inside a multistory building and living room and the balconys are the porticos.The mud roads have become concrete one with lot of potholes and no footpath to walk about. If you remember the Chai Beary bullock cart has given way for the modern cars and motor cycles.Only the Bhat hotel near bus stand still remains. Bejai new road is still remains named Bejai new road although it is ages since it has been repaired.Pazee & Chutney is long gone and it has become Idly -VADA-Dosa-Bread-Butter etc.etc.I don't know which Rasquinhas you are quoting. There are few of them still living at Bejai. But good to read into your dream. It shows what we have lost and what we have gained. Good for reading and recollect. Nice writing; a very good article. 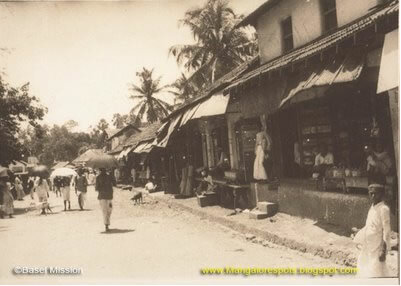 You took us back in time by 80 years or so and gave a beautiful portrait of life in Mangalore (Kodiyal) of yesteryear. Good imagination. Nostalgia for homeland and a little help from Bacardi did the wonders. Keep writing.